I have been enjoying visiting you and seeing your tea cups each week! I really appreciate all of you who participate and those of you who come to see. Martha (click on her name and go visit her) and I do love hosting this party. We hope that each one of you and your family are healthy and happy this holiday season. Tis the season to be extra grateful, and we are thankful for YOU! This tea cup and saucer I am showing today is from my Christmas china set. It is similar in color to the Johnson Brothers china I shared last week, but it has a different pattern of flowers, leaves, vines, and berries. The plates have different patterns on them. The dinner plate is similar to the saucer for the tea cup. The tea cup is very comfortable in the hand and holds a good amount of tea (or hot cocoa....mmm). Here is the salad or dessert plate. This cup has a simple loop handle with a thumb rest. These dishes are not vintage, they are only about 10 years old. My husband gave them to me for Christmas. I can't tell you how thrilled I was Christmas morning to see all those red boxes from Williams and Sanoma stacked by the tree! These dishes make a very festive table for the holidays. I really appreciate the thoughtfulness of my husband in gifting these to me. Next I am sharing some of the things I have been working on for Christmas. I do enjoy creating the gifts I give each year. Wish I could craft an I Pad! Here is a Marie doll I am working one. I am using Barbara Willis's book "Cloth Doll Artistry". I have not done her head yet. Here is a pair of bird earrings I have made with natural stone beads, some vintage rhinestone rondelles, and a bird charm. This necklace is a gift for a friend. Are you making gifts too? Below is a clip of one of my favorite movie series to watch during the holidays. It is the BBC's production of Jane Austen's Emma. Thank you so much for stopping by. I know this is a busy week for us all. 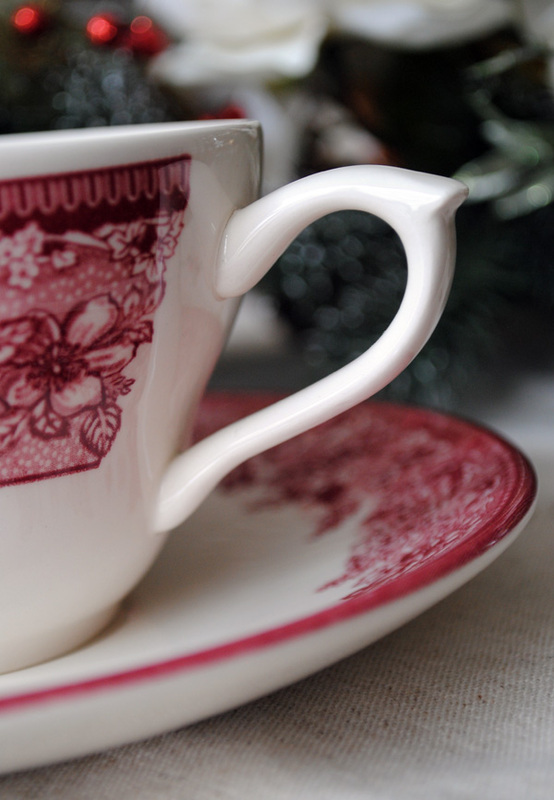 If you would like to join in, Make a post of a tea cup you would like to share and then sign up with Mr. Linky below by filling in the two blanks. Make sure you test the link once it show up. Last week there were a few of you I could not reach. Check out my newest free tutorial video on how to make a Vintage Holiday Banner! How sweet of your husband to give you such a lovely dinner set, and the colors are so festive without being over the top. Thank you for hosting this fun event each week. What a beautiful share this evening. I love, love, love this Christmas pattern you shared tonight. How beautiful it is. Your skaters on the plate tho, they took my breath away. How beautiful they look. Everything is looking a lot like Christmas over here sweetie. It sure is. Love the necklace you made for your Sis. The star is perfect. I love to pop over and see what delightful things you have to share. I thank you SO much for sharing with me. 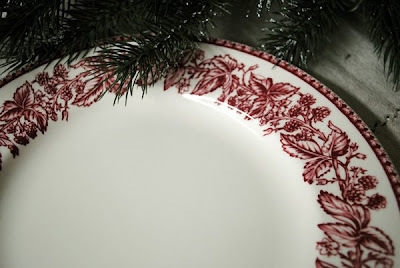 The china is gorgeous and I would be over the top thrilled to find those under the tree myself! Beautiful reds and perfect for Christmas! 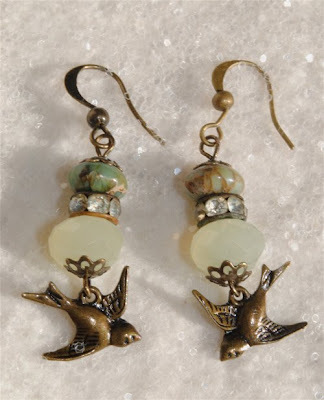 Those little skaters on the plate are adorable and I love the birdie earrings! Such a lovely post; thank you. I love this idea and am so glad I found it, I have a little collection but my MIL has a huge one so I am joining in for a while!!! I love your dolls and I love your teacups you show....and all jewels now was awsome, earrings with birds was very very nice. Wow so many thing to see on this post... I love the litte sckaters on the plate, the christmas set, and the presents you made, all awesome! And I am looking forward to the Marie Doll! Your husband has very good taste in dishes and wife~ the dishes are beautiful and any Christmas table set with these would appeal to me very much. I like the little skaters too. I wish I was on your Christmas list, your handmade items are uniquely beautiful.The doll body and dress are exquisite! I am getting some weaving done for Christmas gifts. Your Christmas china is beautiful -a great color and pattern. You will certainly have some very happy recipients on your gift list when they receive your handmade jewelry - it is gorgeous. I especially love the bird earrings. My hubby and I are both making gifts for our new granddaughter. His is a cross-stitch birth stats picture and mine is a shaggy raggy baby quilt. I can't get over how precious your doll is! Gorgeous jewelry too! you are a gifted artist! blessings friend. Thanks for stopping by my blog. 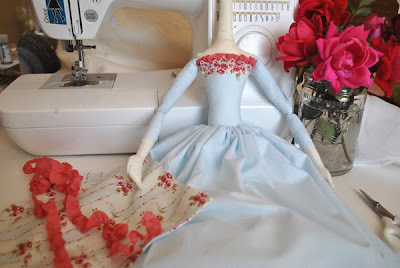 I've added the link for my post again ... your cloth doll is beautiful! 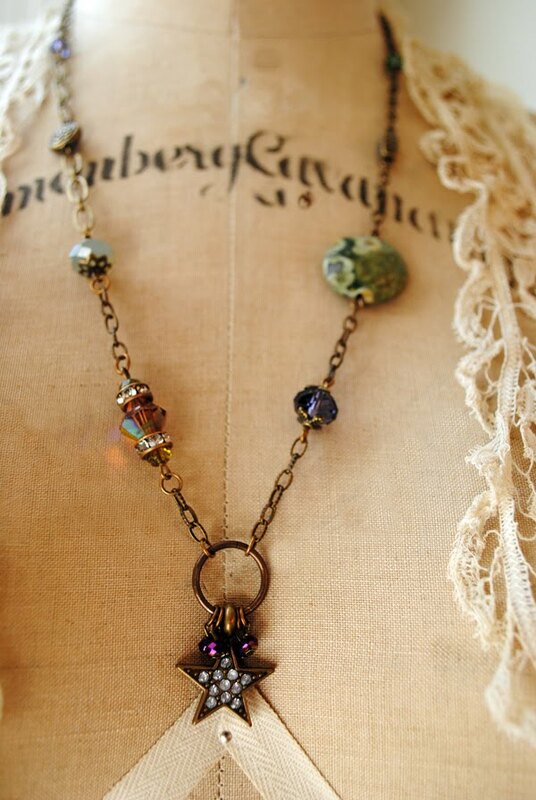 And your necklaces are just fab. I have enjoyed watching all what you show today...beautiful gifts! Terri...magical enchanting.,.and sooo beautiful...I love the jewlery( wow)..the doll( awesome)..the gorgeous cups of course...wow..gorgeous post..SHINE ON!! Hi Marty! What a darling set! Love those skaters too. This is my first Tea Cup Tuesday from my mini blog. I have tea cups in my mini world too. You are truly so talented Terri. I can't wait to see your doll. This china is beautiful. I love how the plates and the teacups are different from the one another. 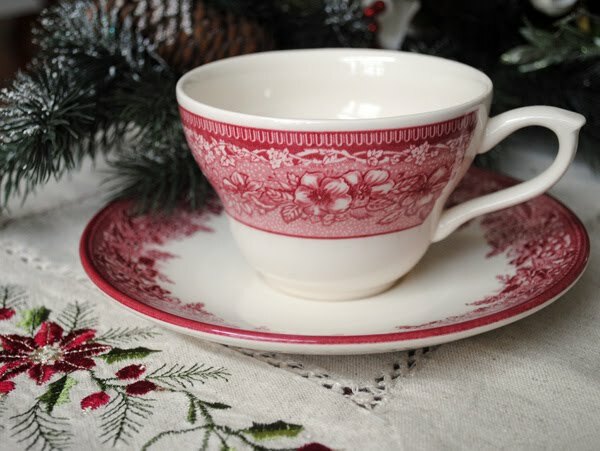 Terri, Your Christmas china is just beautiful! 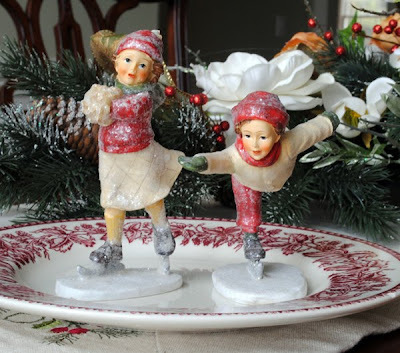 I love the skaters on the plate - it truly is winter, isn't it? You are making many nice gifts for Christmas. I think it is wonderful to give handcrafted items. They mean so much! Love the doll and the necklace. You are so talented, Terri. Thanks for hosting. 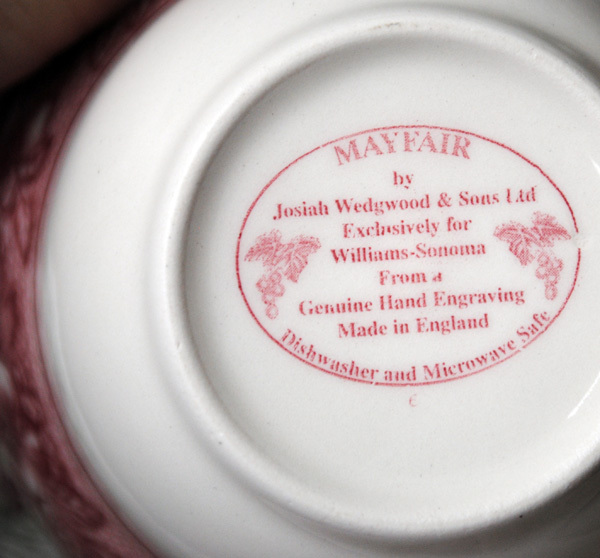 What a classic beautiful tea cup! I love the beautiful things that you are creating!! You are so talented!! i cannot wait to see the doll when she's finished! LOVE the dishes!! What a sweetheart of a hubby to surprise you with those beauties! I bet they set a really stunning table! I can't wait to see your Marie doll finished, I just know she's going to be a beautiful treasure! And my goodness, you've been really busy! Your jewelry pieces are stunning! 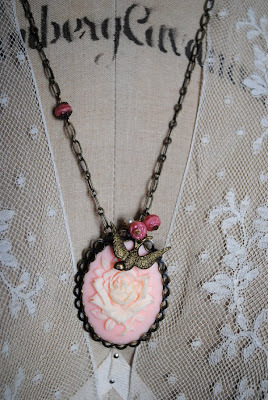 I love the pink rose focal piece! YUM! 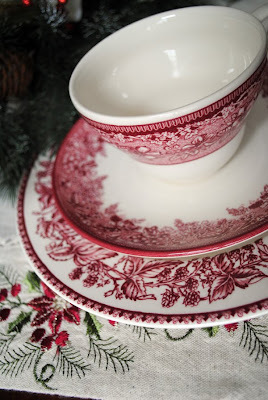 I really like these red and white dishes...I can think of lots of ways to use them besides just Christmas! So glad I stopped by your lovely blog tonight. It was just holiday inspiration I needed. I just enjoyed your new video and you really have a charming presence when you are teaching! I can't wait to try and make a garland. Maybe I will have time to make one for a friend for the holidays (being optimistic). All your projects are beautiful and what lucky friends you have to be receiving such handmade treasures. Happy Holidays to you! Just stumbled on your blog! I love love it! I also love teacups! Thank you so much for stopping by and your sweet comments about my Santa Tea...The only thing I can tell you about my teacup and saucers is they are part of a Gibson Everyday Dinnerware set I purchased about 5 or 6 yrs ago at Walmart...It came with metalic red charges and matching napkin rings..It had a setting of 8 places all for $29.99...I got it to use for Christmas that year but loved the set so much we have been using it as our "everyday" set ever since. I tried to find the name of the pattern on www.gibsonusa.com as it was printed on the bottom of the cup as part of the stamp, but I guess the pattern is no longer a part of the line. I love the raised dimples on them, gives it a nice vintage feel. I love the dishes. I have seen so many beautiful things made by Williams Sonoma while visiting blogs. Thanks for sharing the gifts you are making. I will have to take a look at the book you mentioned about making dolls. Oh, and I love the first picture of the skaters on the plate! Terri, your china is beautiful, and did you make that lovely embroidered tablecloth(?) underneath them? Thank you very much for sharing! Your sweet hubby knows how to bring a smile to his little elf wife!!! That is a gorgeous set. And that headless doll.....I can't wait to see her finished. Your work is just perfection. 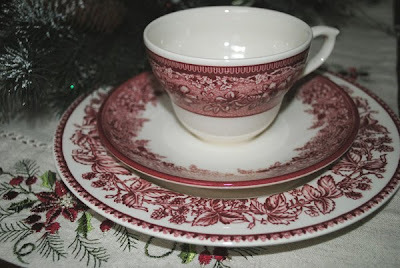 Your Christmas China set really beautiful and Your jewelry pieces are absolutely stunning! Hi Terri - Just want to say I admire all your handmade gifts. They are all soooo beautiful! Love the earrings and neclace you made for your sister and friend. They are very lucky! And just like you, I love that version of "Emma" from BBC. I watch it whenever I want to feel happy and "british"! Dear Terri ~ you do such a variety of really beautiful things SO well! Always a delight to visit ! Everything Jane is my favorite things! Especially Mr. Darcy! Love your blog!